University of Vermont music professor Yutaka Kono's office is fairly utilitarian, but on a sunny day, it's lit up by two enormous tubas resting on their bells and glinting in the sun. Kono, an accomplished tuba player with a ponytail and a ready smile, earned a doctorate in tuba performance. He has garnered awards performing as a soloist, in a quintet, and in orchestras and bands in several states, as well as in his native Tokyo. Kono also composes for his instrument, among others, and has seen two of his pieces performed at FlynnSpace since he moved to Burlington four years ago. Lately, though, the 43-year-old musician-composer has been gaining recognition for a third interest: conducting. 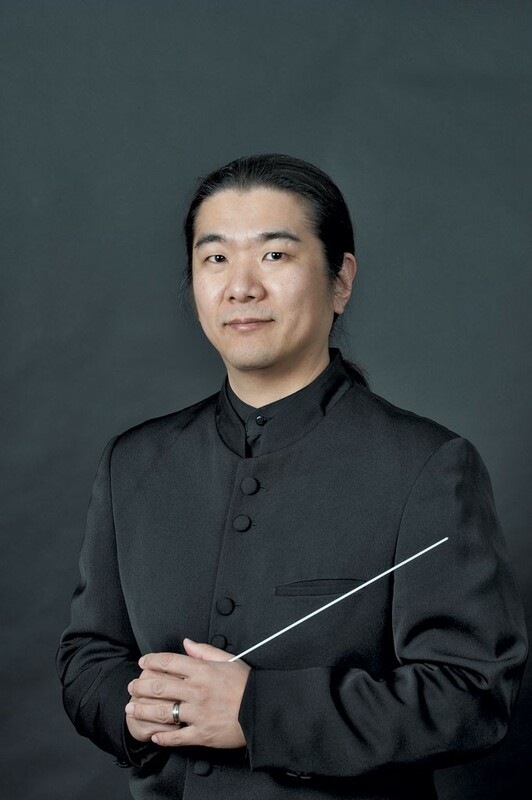 Kono's duties at UVM include conducting the college orchestra; based on a video of his work at one of its 2013 concerts, he was named a finalist for the American Prize in Conducting (college and university orchestra division). He's in his third year of conducting the Vermont Youth Philharmonia, the intermediate-level ensemble of the Vermont Youth Orchestra Association. And last summer, Kono was selected to attend the Eastman School of Music Summer Conducting Institute, where he led the Rochester Philharmonic Orchestra. All those distinctions made Kono a strong choice for his new position as the artistic director of Burlington Chamber Orchestra, Chittenden County's only professional chamber orchestra. In that role, he will conduct at least one of BCO's three concerts per year. The 34-member BCO is now in its eighth season. Perhaps fittingly, the group's founding conductor was Kono's predecessor on the UVM Orchestra podium, Michael Hopkins. (Another parallel: Kono's wife, Kathleen Kono, plays in BCO's violin section, as did Hopkins' wife.) Since Hopkins left for a job in the Midwest four years ago, the BCO has opted to bring in guest conductors; Kono conducted one concert last year in that capacity. Meanwhile, two committees made up of BCO members have been making artistic decisions. They will continue to bring in some guest conductors and collaborate with Kono on programming. "But there were advantages, musically, to having some consistency of leadership," explains BCO violinist Sofia Hirsch, who chairs the musicians' committee. "And Yutaka has a great personality, is extremely knowledgeable about music and is willing to work with us collaboratively — which is key for a group coming off four years of having musicians make all the decisions." Kono comes from a country far more oriented toward classical music than the U.S. When he was growing up, Japan's main television stations would pause their programming once a day to broadcast an "A" note so that musicians could tune their instruments, he recalls. Tokyo supports 12 full-time orchestras, and music instruction is required from elementary through high school. While an elementary student, Kono — who was already playing the piano — heard a Mozart horn concerto and joined his school band so he could learn the notoriously difficult brass instrument. "But I just couldn't get that result," he says with a laugh, "so my band director said, 'Why don't you play that tuba over there?'" Kono obliged. He stuck with tuba through the beginning of high school, though his musical tastes were shifting to heavy metal and rock. When he was 16, Kono moved to the U.S. as an exchange student in New Mexico — and never returned to Japan, except for visits. During his two years of American high school and two at Eastern New Mexico University, he began listening to avant-garde music by Henry Cowell, Krzysztof Penderecki and John Cage, composers who left elements of their works to chance. "I realized there's a lot more to music than power chords," Kono recalls with a chuckle. Kono left NMU for a tuba scholarship to Bowling Green State University in Ohio. There he wrote an experimental work for a synthesizer tuned to a gamelan, a percussive Indonesian ensemble instrument. This early composition "sounds like an out-of-tune instrument being played," says Kono. He now teaches both electronic music and traditional orchestral works — what he calls "the polar ends of music." Kono continued to focus on the tuba while earning a master's at the University of Minnesota Twin Cities and then as the University of Texas at Austin's first doctoral candidate in tuba performance. Discovering an interest in conducting — which he calls "the pinnacle of music" because "you have to know the score better than anybody" — Kono viewed his musicianship as his entrée. "I knew I had to become a better performer first" before launching into conducting, he recalls. In fact, according to Tom Toner, who chairs UVM's Department of Music and Dance, the primary qualification for strong conducting is "being a good musician." In that background, Kono resembles Vermont Symphony Orchestra conductor Jaime Laredo, a highly accomplished violinist who never trained academically in conducting. Toner, who has played percussion with the VSO for 25 years, says "the orchestra sounds so much better than it used to" as a result of playing under the musician's baton. Kono honed his conducting skills by starting an orchestra with his colleagues at Texas A&M University-Kingsville, where he taught after earning his degrees. The endeavor afforded him a five-year position as assistant conductor and artistic director. That's no small thing; conducting positions are so few in the U.S. that the rare opening draws hundreds of applicants. When Kono applied for the UVM position, Toner, then on sabbatical, watched each of the final candidates conduct. "It was pretty clear we got the right person," he recalls. "Kono is very easy to follow and very good at interacting with people, which is hard to find." "He's not an autocrat," says BCO violinist Ana Ruesink, noting that Kono takes into account the professional musicians' many "opinions on how things should sound." Ruesink describes Kono's conducting style as "quite energetic and forceful, I would say. He has a real power on the podium. My family has commented that he's fun to watch." Kono first learned of the BCO after applying for the UVM job: An internet search of "Burlington" brought up the ensemble's performances on YouTube. The quality of the group, particularly the "unified tone of the strings," impressed him. So did its very existence. For a city of its size, Kono remarks, Burlington "has a lot going on — so many concerts and festivals." Speaking at a BCO reception held last week in his honor, Kono said he plans to increase the group's number of annual concerts and "bring the BCO back to UVM" — that is, move performances from Saint Michael's College, where BCO has performed since Hopkins' departure, to the UVM Recital Hall. Kono also envisions collaborative projects with his academic department, such as professional recording in its studio, which was recently established to support the new music technology and business concentration and minor. The move will highlight the many ties BCO already has to UVM — including about a dozen faculty and alumni who play in the ensemble, says Hirsch. "We're homegrown," she points out, and adds that "a lot of us grew up playing in the VYO — that list is ridiculous." The choice of Kono as artistic director reflects the local flavor, Hirsch says, and it reinforces a message: "I think people should know, 'Hey, you can make a musical life here in Vermont.'" Kono, for one, is happy to have done so. Asked what his dream conductor job is, he answers with a wide smile, "This is it." The Burlington Chamber Orchestra performs with guest conductor and violinist Soovin Kim on Saturday, February 7, 7:30 p.m., at McCarthy Arts Center, St. Michael's College, in Colchester. $10-25. Kono will conduct his first concert as artistic director on Saturday, May 16, 7:30 p.m., in the same location. The original print version of this article was headlined "Knowing the Score: UVM's Yutaka Kono Is the BCO's New Artistic Director"